Dorsey Alston Realtors agents sold more detached, single-family homes in Atlanta’s most desirable neighborhoods than any other office in 2017, according to a year end review of First Multiple Listing Service (FMLS) data. This includes Ansley Park, Brookwood Hills, Chastain Park, Collier Hills, Wood Valley, Argonne Forest and North Buckhead. Dorsey Alston agents also led the Atlanta market in number of homes sold for more than $1 million. 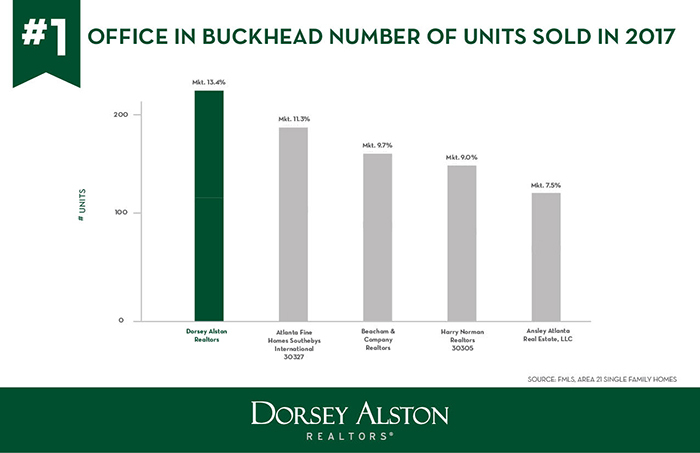 The review showed Dorsey Alston with the largest market share at 13.4 percent in Area 21, which is Buckhead. As the numbers indicate, Dorsey Alston experienced a banner year with total transactions up 15 percent and total closed volume up 12 percent over the previous year. For a company now in its seventh decade in business, that is a remarkable feat. Dorsey Alston stalwart Patti Junger led the team producers, followed by Charles Guthrie of the Guthrie Group; Marinac Greene led by Stephanie Marinac and Harvin Greene and the Blair Sells Team led by Blair Huckeba. Alden Potts led the firm as the top individual agent with a total volume for 2017. Kathy Ghirardini, Robert Peterson, Rudy Harrell, Shanna Smith, Jason Cook, Kate Burke, Allan Minter, Lindsay Dendy and Ethel Wotten rounded out the top ten individual agents in volume.